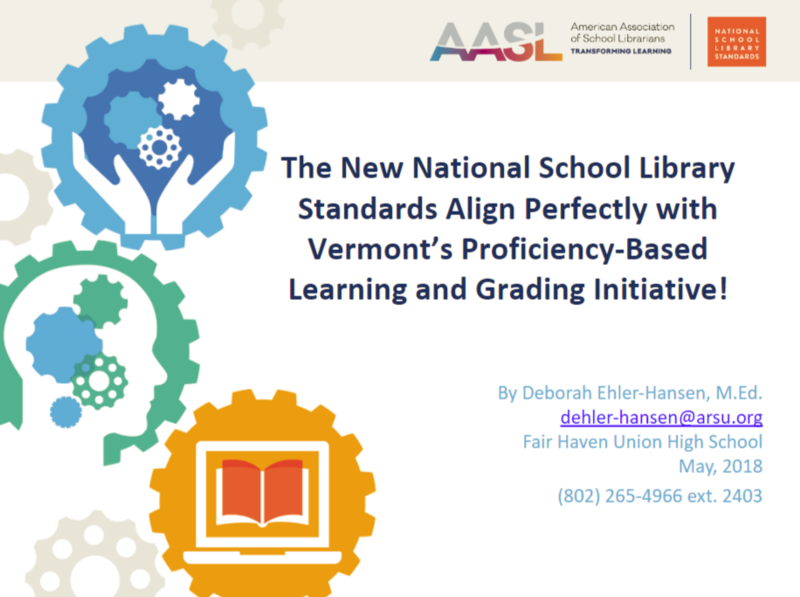 Vermont School Library Association - The new National School Library Standards Align Perfectly with Vermont’s Proficiency-Based Learning and Grading Initiative! The new National School Library Standards Align Perfectly with Vermont’s Proficiency-Based Learning and Grading Initiative! This past April and May I have facilitated four workshops/sessions across the State of Vermont on the new National School Library Standards, reaching about 95 Vermont School Librarians. I have adopted the new National School Library Standards to use as performance indicators for our school libraries within our district. I then broke the performance indicators down into learning targets, from which I have constructed my lessons, formative assessments, and summative assessments. Hoping to make the transition to Proficiency-Based Learning and Grading by 2020 a little easier for Vermont School Librarians, I am sharing the Proficiencies, Performance Indicators (AASL), and Learning Targets (skills/competencies - AASL) I created (at the 9th-12th grade level), which can then be modified to meet the needs of students at the elementary and middle school levels. Please see the presentation below to learn more. If you have any questions, please contact dehler-hansen@arsu.org.